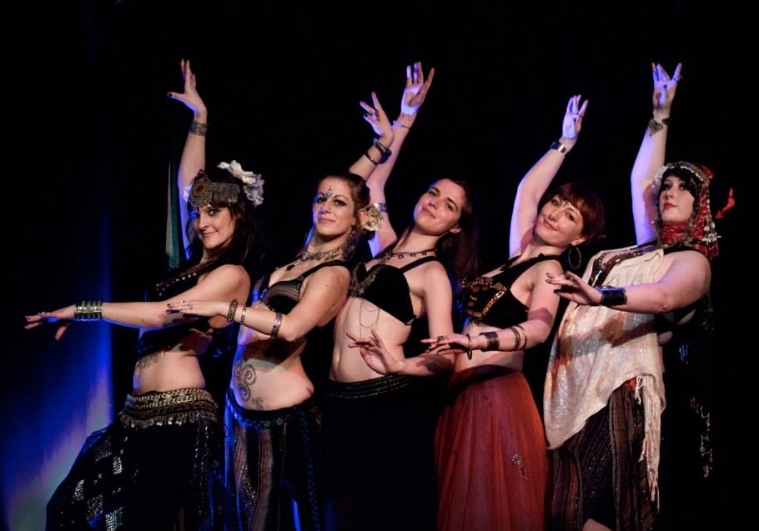 Jasmin Victoria founded Junonia Dance Company in 2011, and the performing troupe runs under the same name (formerly Junonia Bellydancemble). The highly evocative name name was inspired by Juno (Roman Goddess and Queen of Gods) and also alludes to Junonia coenia (Buckeye Butterfly). Juno is often portrayed as a beautiful woman who also hones her militaristic nature, aptly fusing both feminine and masculine attributes. Junonia coenia on the other hand refers to concepts such as continuous transformation (metamorphosis) and the re-invention of the self. JDC performed their debut numbers Heartbeats by The Knife and Dope Crunk by Beats Antique at Celebrating the Body in Dance in August 2011, an event to raise funds for Bodywhys- the Eating Disorder Association of Ireland. The primary goal of the event was to "dance yourself (body) positive" and to celebrate the achievements of the body as a temple. JDC has been performing at haflas and events around Ireland ever since, Goulash Disko, Fusion Market, Fusion in Motion etc. For Junonia Dance Company info/news/workshops like our facebook page.